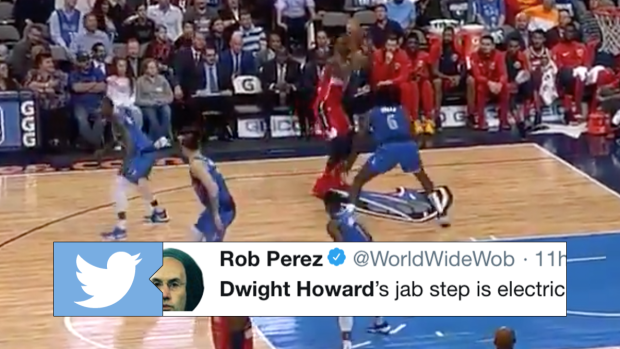 On Tuesday, Dwight Howard played his third game of the season for the struggling Wizards as they took on the Mavericks in Dallas. To say the Wizards have gotten off to a rough start this season would be an understatement, but they were 1-1 with Howard in the lineup heading into the game against the Mavs. Unfortunately Howard couldn't help them get a second straight win as Washington lost by 19 and if there was one play to sum up the loss, it was this jumper from Howard. Howard was feeling himself in that moment for sure. That jab step was absolutely electric and it gave everyone watching hope that the jumper would fall. That couldn't have been further from the actual outcome, though, and we're sure we'll be seeing that jumper on the next edition of "Shaqtin' A Fool."